Some days I have no idea where I find such recipes, but when I found this one I immediately thought that it would be a fantastic relatively easy dinner providing you can find preserved lemons, but if not, plan ahead and make a few using anyone’s easy and quick versions. 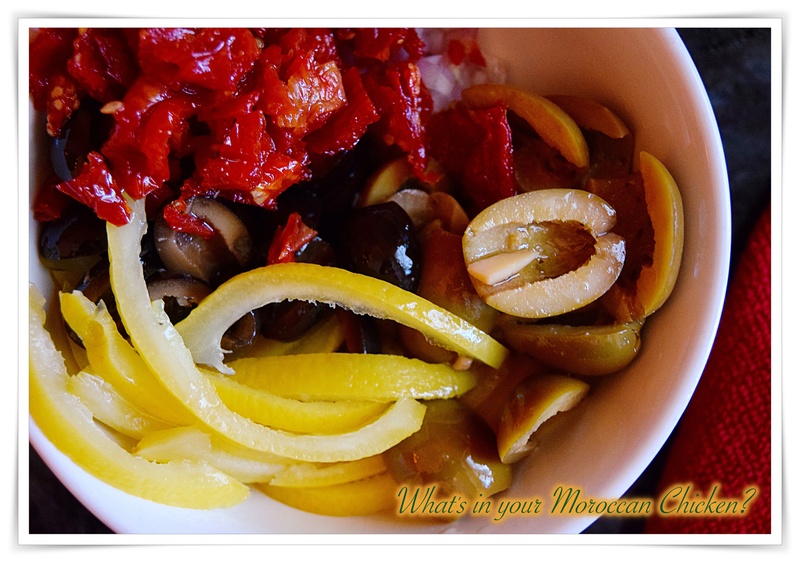 I loved the flavors and with the addition of previously made tajine spices, it was even better. My only complaint was that I am not a chicken breast lover and the next time I make this, I’ll add chicken thighs and drumsticks, Mikey liked the chicken breasts though and I guess most people would. *Optional Tajine Spices, sprinkle over the seasoned chicken breasts before sautéing and just a few pinches in the sauce before covering and simmering. Heat the oil a medium straight-sided skillet over medium-high heat. Dry the chicken breasts well and sprinkle evenly with the salt and tajine spices if using. Place the breasts skin-side down in the hot pan and cook undisturbed until deep golden brown, about 5-6 minutes. Using tongs, turn the chicken and continue to cook for another 5 minutes. Remove to a plate while you make the sauce. Add the shallots to the pan and sweat, stirring occasionally, for a minute. Add the strips of preserved lemon, olives, sun-dried tomatoes and stir to combine. Deglaze with the white wine, scraping up the brown bits from the bottom of the pan with a wooden spoon and sprinkle in about 1 teaspoon of the tajine spice. Simmer for 3 minutes to reduce slightly. Add the chicken broth and return to a simmer. Add the oregano and the chicken back to the sauce. Spoon some of the liquid over the chicken. Cover the pan and simmer gently until an instant-read thermometer registers 160º, about 25 minutes. Allow the chicken to rest in the sauce for 10 minutes. Stir in the chopped parsley. 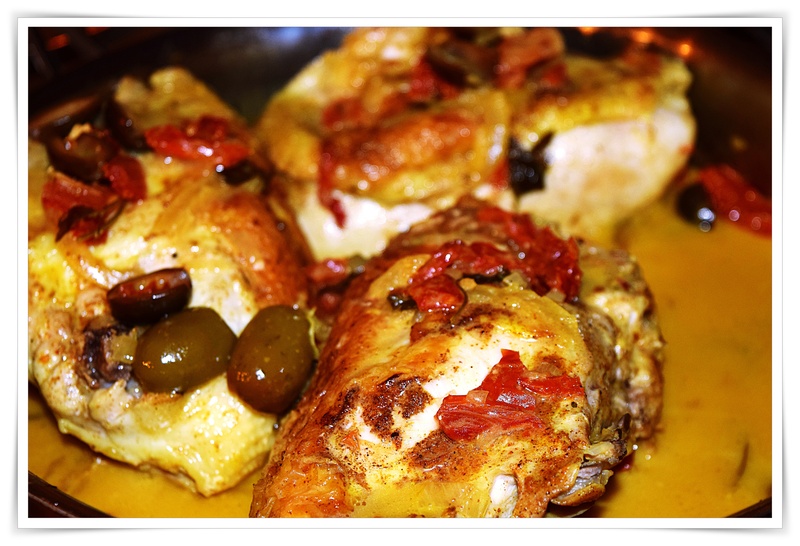 Print this recipe Moroccan Chicken.